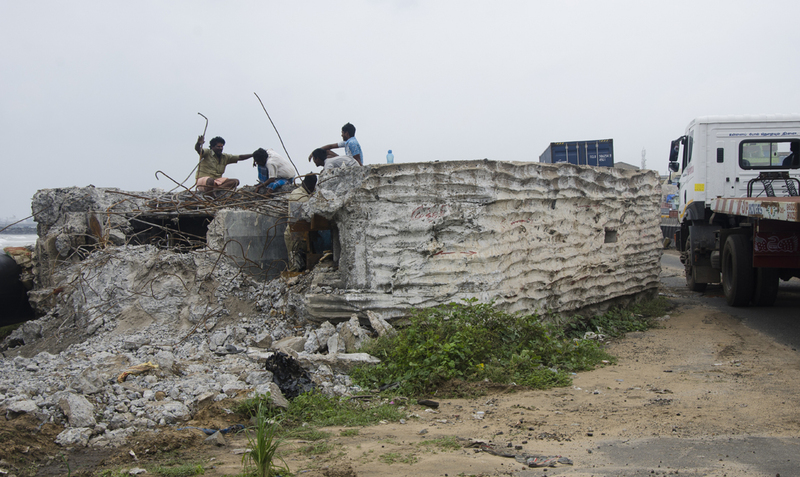 For years, this square shelter made of concrete has been lying uncared for on the side of the Ennore Express Highway. It has been used as a makeshift urinal and toilet, it has been lived in by squatters, and from the numerous bottles found in it, has been used as a bar as well. But nobody can deny that this is an air-raid shelter left over from the World War II. Known affectionately as the pillbox, it has been around for quite a while. This is not an architectural landmark. But it is certainly a historic marker. It reminds us of a war from which our city actually benefited in a big way, never to look back thereafter. Only now, it is squarely in the path of a proposed pipeline of Chennai Petrochemical Corporation. And efforts are on to demolish it. Last week the wreckers began hammering away at it when locals from the Kasimedu area gathered around asking the reason for the demolition. The Hindu was alerted and it carried a detailed story. That did the trick and work stopped, but not before some damage was done. But a whole plethora of questions have since emerged, all of which are indicative of a larger malaise in the way heritage is handled in our city. Whom does the shelter/bunker belong to? The army has no records of its existence, or at least there is no one there who knows. The Archaeological Survey does not have anything to do with, it as it recognises only monuments that are classified as ancient. The Heritage Committee of the Chennai Metropolitan Development Authority says this is not within its jurisdiction as it has, in its blinkered fashion, decided to restrict its scope to just the 400 and odd buildings given to it by the High Court of Madras. And even there, it is doing precious little. The Corporation, to give it credit, is willing to organise a shifting of the shelter to somewhere else, provided some agency or private donor is willing to bear the cost. Of course, transferring this structure is no easy task as it weighs several hundred tonnes. Bureaucracy is unlikely to consider this matter top priority, but to the few who are concerned with the matter, the lack of proper documentation and ownership may prove a deterrent. In the absence of anyone coming forward, the bunker may have to go. Not that we protected it or maintained it well when it was standing undisturbed. What is also amazing is that not one person in officialdom had any idea about the history behind the structure. And they did not bother to find out as well. All of this raises larger questions. When the maintenance of even important public buildings is not adequate, what price the lesser-known landmarks of the city? Secondly, what is the process by which we can add structures to a list of historically important edifices in our city? If an Anna Nagar arch can be declared a heritage monument based on a Chief Minister’s whim and then protected, why can a World War II bunker not enjoy the same status? What protection do uncared for structures like this have against demolition or wanton damage? Presently, officialdom has asked The Hindu to investigate the background of the pillbox. But is it not the onus of the Government to look into its records and see when this shelter was built? Work has been suspended for the nonce on demolition, but this is not likely to remain that way for long. Unless some details emerge quickly. But since this is a city where emulating Singapore is considered the best way, let us point out that such pillboxes and the World War II constructions are well protected there. EDITOR’S NOTE: The Government Museum has plenty of space for locating this air raid shelter as a memory of World War II, just as the Fort Museum remembers the Great War with relics of the Emden’s shelling of the city and World War II with a bomb fragment from a raid by a solitary Japanese aircraft.